Following hot on the heels of the ZEZ consultation, a swathe of transport-focused events have been programmed in our city, with freshly energised and newly optimistic residents and campaigners riding the wave of the largely positive reception. First there was the launch of the Claudia Charter last year and the Rose Hill & Iffley Low Carbon petition calling for continuous, separate cycle tracks across the city [watch the accompanying film and sign it here]. 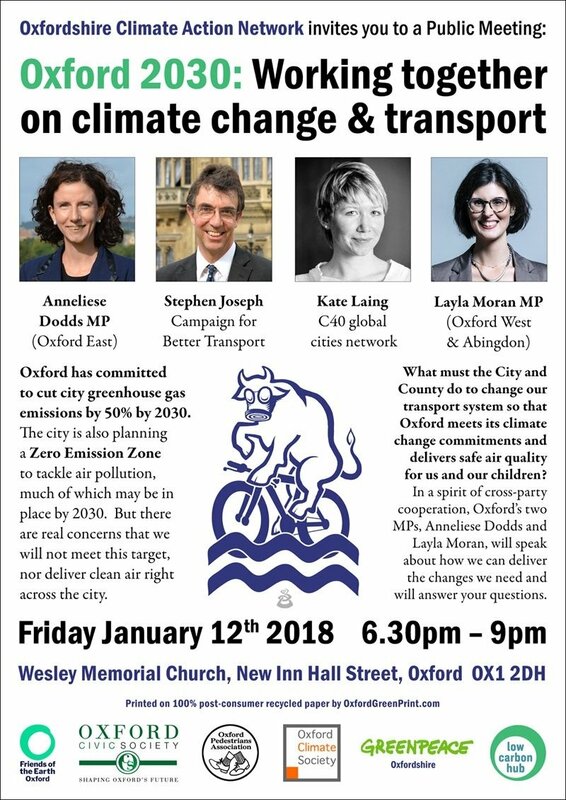 TONIGHT Oxford Climate Action Network is hosting Oxford’s two MPs, Anneliese Dodds and Layla Moran, plus Stephen Joseph, Director of the national Campaign for Better Transport, and Kate Laing of the C40 global network of cities tackling climate change, at their event ‘Oxford 2030: Working together on climate change & transport‘. The evening will address the following question: What must the City and County do to change our transport system so that Oxford meets its climate change commitments and delivers safe air quality for us and our children? 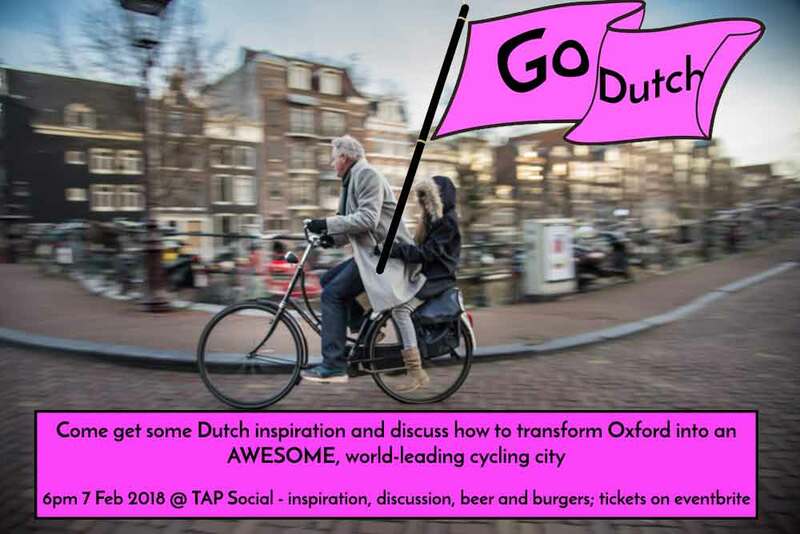 Come for an evening of Dutch inspiration, dutch courage c/o our lovely hosts Tap Social, and seriously yummy burgers from the Greenbox Food co.
Join us to seek inspiration from the world’s leading example of bicycle- and pedestrian-friendly urban environment: the Netherlands. Robert Weetman will be on hand to elucidate the wonders of Dutch urban transport philosophy and its huge societal payoffs. The fundamental ethos of this meeting is: Netherlands did it, We can too. Come to get excited by the Dutch reality, stay to plan for its realisation in Oxford. Attendance is limited in order to ensure maximum interaction and group discussion. Tickets can be purchased here, for a nominal fee of £1. So how has Groningen has got it so right? Groningen removes the conflict, so people are not cycling by fast cars, lorries etc. …people of all backgrounds and stages of life cycle along chatting, eating ice cream, carrying oars, pot plants, whatever. The city appears quiet and relaxed. How do we bring taxis on board? How do we diversify those cycling and those asking for cycling improvements? See you on the 7th?